Until tonight, I believed that the Varsity had the best onion rings in Atlanta. 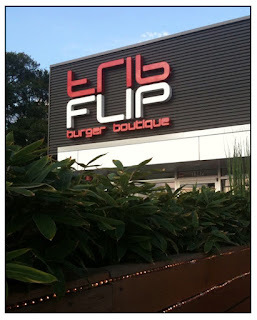 A couple of weeks ago, a co-worker introduced me to Flip Burger Boutique. It’s a unique ‘burger shop’ on Howell Mill – the part on the west side of I-75 that is being revitalized. I’ve been there one other time and went back tonight with Scott. The burgers truly are gourmet. The ‘beef’ burgers are a combination of hanger steak, brisket and short rib. (You can also order turkey burgers, chicken sandwiches and a variety of seafood patties including fish, crab and lobster – if available.) But the varieties are what make them unique. For example ‘southern’ features a country fried steak patty with pimento cheese and green tomato ketchup. There is also a lamb burger and kobe beef, for the more refined taste buds. We went tonight specifically for the Krispy Kreme milkshake. (My husband had a Krispy Kreme donut cake for his groom’s cake if that tells you anything.) 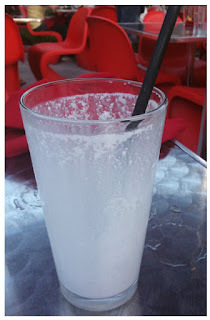 They are as well known for their milkshakes as their burgers, with flavors as exotic as foie gras and pistachio with white truffle. Yes, real foie gras. But tonight I had the onion rings. Ummm. Delicious. On my previous visit, I had the turkey burger – which I almost never order – and it was alright, but tonight I decided to keep it traditional with the original Flip and onion rings. I was glad I did. The rings were a perfect combination of crisp and sweet – though I’d order the sauce that comes with the fried okra; it has a little bit more kick than the honey mustard. 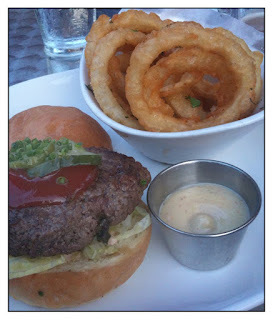 The burger was delicious – I dare to say one of the best I’ve ordered in a restaurant. They look small on the plate, as the rolls are a bit smaller, but they are thicker than a typical burger. The menu says they are 5.5 ounces – which in my book is plenty of meat. As a tip, when you order your burger, order one grade up (more done) than you typically would. I learned this, too, on my previous visit. I’m a rare meat kinda gal – like, a good vet could revive my steak – but here, I ordered the burger medium rare & it still was a little ‘tartare’ – which is fine for me, but not for many. So, if you typically go with ‘medium’ you might want to kick it up a notch. Like the onion rings, their sides are enough to warrant the visit. In addition to the traditional fries, onion rings & sweet potato tots and the more neuvo-traditional fried okra & asparagus fries, they serve a variety of organic sides with salads and soups. Both times I’ve been it has been very crowded, and so it is pretty noisy inside. But, like tonight, the outside dining was nice, food was good and the company, unbeatable. This is Richard Blaise's restaurant, yes? I don't know, Tiff… Should I know him?